The monastic liturgy should be of the highest importance in any Benedictine community. The bulk of the singing at Douai’s monastic liturgies is performed by the monks, either as a full choir or using a schola comprising several monks. However, on a number of Sundays and feasts during the year, as well as the major liturgies of Christmas and Eastertide, our lay choir, the Douai Abbey Singers, augments our worship, complementing the monastic plainchant with polyphony both old and new. Their varied repertoire ranges from late mediæval Masses to modern motets, including a number of Mass settings written especially for Douai Abbey by Roxanna Panufnik and Colin Mawby. The Abbey Singers maintain a very high standard, and have made a number of recordings, and have sung at other venues, including Westminster Cathedral in London and Notre Dame Cathedral in Paris. Dr John Rowntree, the Abbey’s Director of Music, is always happy to hear from anyone interested in singing in the choir. 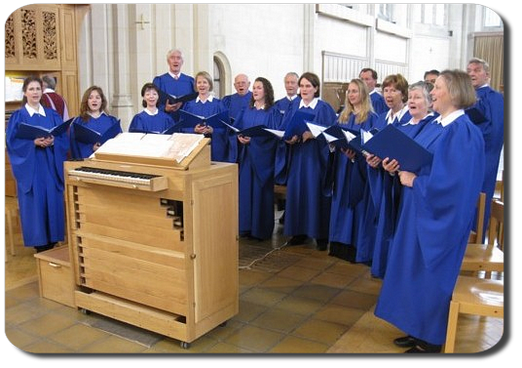 You can get more information by consulting this brochure on the Douai Abbey Singers.